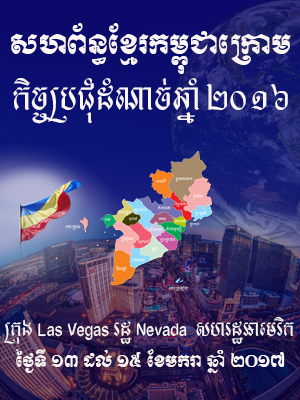 During this holiday season and with the New Year fast approaching, on behalf of the Khmers Kampuchea-Krom Federation (KKF), I would like to wish you and your family a joyous holiday season and a new year filled with health, happiness and prosperity. One that is filled with hope for a world to be truly at peace. The best part of the holiday season is remembering those who make the holidays meaningful. We would like to say a special thank you to our KKF members who have worked tirelessly around the clock and the world to ensure that the Khmer-Krom voice is heard. 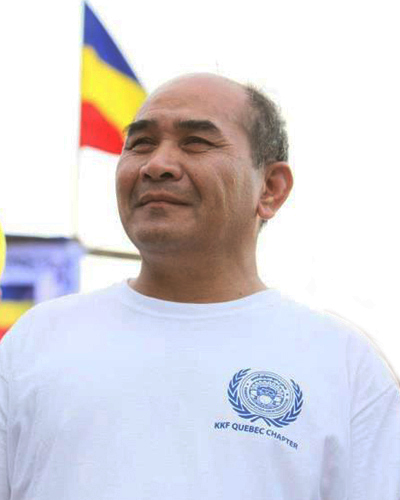 From San Francisco, New York, Washington DC (United States), Toronto, Montreal (Canada), Paris, Lyon, Toulouse (France), The Hague (Netherland), Geneva (Switzerland), Brussels (Belgium) Canberra (Australia), Bangkok (Thailand) to Dili (Timor Leste), Gyeongju (Republic of Korea), our voice for the voiceless Khmer-Krom in Kampuchea-Krom was loud and clear. In May 2016, the members of KKF around the world came to San Jose, California, to elect the Board of Directors (BoD) for the 2016-2020 term. The Code of Conduct was signed by the newly elected BoD, thereby upholding their professional commitment to serve the interest of KKF, first and foremost. As we close the final chapter on 2016, this upcoming new year will kick start with a celebration of our collective work for the last twenty years. From January 13-15th, the KKF BoD and supporters will meet at the heart of Las Vegas to plan for 2017. The BoD members will summarize the activities of 2016, answer all the questions from the members and present the plan for 2017. I look forward to meeting our KKF members at this important event. Geneva (March 11, 2015)- Special Rapporteur (SR) on Freedom of Religion or Beliefs, Heiner Bielefeldt, opened up a side event for Religious Freedom in Vietnam and The Mekong Delta, co-organized by the Khmers Kampuchea-Krom Federation (KKF). The SR gave an overview of the reality that exists for indigenous peoples and religious minorities in Vietnam, speaking of the contrast between the surface appearance and the actual systemization of control over religious life and institutions within the country. “Religious life is only possible within certain established channels. These channels are very narrow and religious communities have to cope with lots of difficulty,” says Mr. Heiner Bielefeldt. Asking if there is a problem with religious freedom, the SR stated that there is a “big problem” with religious belief and freedom. “To be fair religious life is possible.. it is open and accessible, and people do access them,” but they do so “within the established channel.” Examples were given of groups requiring to request for permissions beforehand to hold religious events and where failure to accept the central decisions were equated to a “rebellious spirit” and were responded by the government with police raids, destruction of house of worships and imprisonment for some people. While Vietnam has some policies to open up for religious freedom, “harsher persecution under the criminal code” remains for groups that wishes to assert religious autonomy. The religious life is under strict “grip of the government control ” and is used to promote patriotic values. “People insisting on [religious] autonomy, freeing themselves from grip of government control and even infiltration. Religion is established to also provide courses on Marxist Leninism. It is not only control but instrumentalizing religion.” The reality is that public and religious life are being monopolized by the government. The side event was moderated by Dr. Joshua Cooper, from the Hawaii Institute for Human Rights, and KKF representatives, Miss Thivanada Kim, and Mr. Don Lam and Ms. Sothy Kien..
GENEVA (3/11/2015) KKF representatives met with special rapporteur on Religious Belief, Mr. Heiner Bielefeldt on pre-session for side event co-organized by KKF. Dr. Cooper spoke about the cooperation between religious groups in coming together to prepare the reports for the SR, the persecutions of Khmer-Krom Buddhists and Degar Christians. He spoke about instrumental role of outside human rights defenders in not only making the violations known, but also in their intervention efforts such as the case of Venerable Ly Chanda who were defrocked and tortured, but was eventually able to secure refugee status in a third country working with the UNHCR. 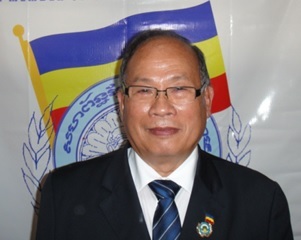 Sothy Kien, provided an overview of the constraint of cultural freedom faced by the Khmer-Krom people. 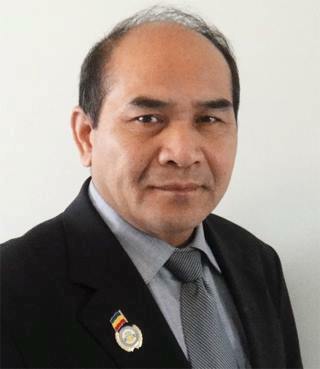 The issue of self-identity and the threat of being labeled belonging to a “separatist” group for asserting one as being “Khmer-Krom” makes the people afraid to call themselves by how they identify themselves. She clarified that “Krom” does not mean ‘separatism’, it simply means below or under, which refers to the historical identity the Khmer people attached to themselves when they were separated from the Cambodian kingdom. On the topic of reprisal, KKF representatives explained the top-down structure of control imposed by the government of Vietnam on their religious institution, which prior to 1975 were self-organized and functioning autonomously. It was noted that such control clearly violates the principle of separation between state and religion which is fundamental to having true religious freedom. On this point, KKF panelist points out the pressure placed upon temple abbots across the provinces to assume memberships with the government created PUBA (Patriotic Unified Buddhist Association), a mechanism to interfere and control Khmer-Krom’s religious life. Using these tools, the Vietnamese government monitored, control and removed religious leaders who they saw as posing a threat to their political and cultural narrative of Vietnam and its various ethnic and indigenous groups – such were the cases of Venerable Ly Nieu, and Venerable Thach Thoeun from Tra Set Temple, Kleang. 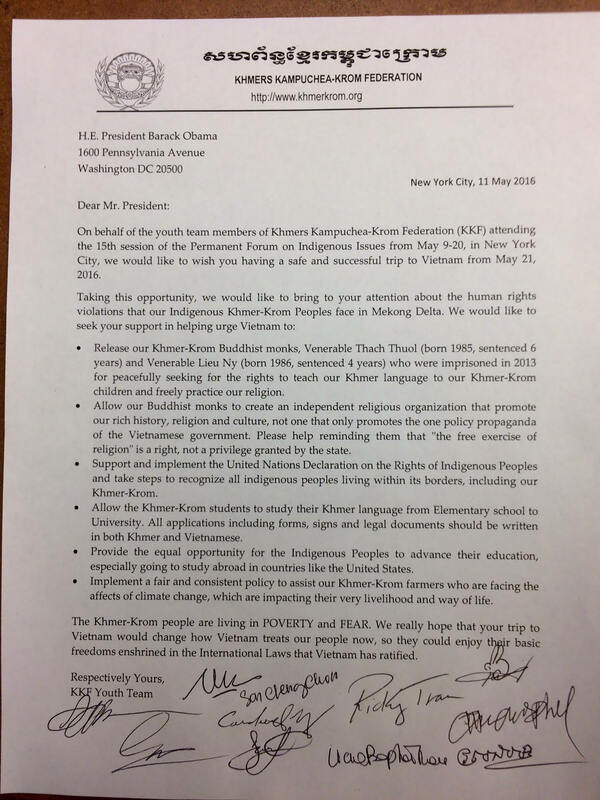 KKF appreciates the effort of the Special Rapporteurs to Vietnam that made the reality of the Khmer-Krom and other persecuted groups in Vietnam known, and validate what we had reported for so long. We thank the SR on the Field of Cultural Rights, Ms. Farida Shaheed on her report in regards to culture and her recommendations to Vietnam. We would like to thank the SR on Religious Belief, Mr. Bielefeldt, for his time and comprehensive report on the actual reality of religious freedom situation today versus what appears on the surface. While noting that severe restriction remains, and needs to be addressed, we applaud the direction that Vietnam has taken to invite UN experts, and urged continued dialogue with all shareholders to ensure that real progress are made and the rights as declared on paper in the country’s constitution are fully exercisable and enjoyed by all citizens. http://www.ohchr.org/EN/NewsEvents/Pages/DisplayNews.aspx?NewsID=15678&LangID=E for Religious Belief and A/HRC/25/57/Add.1 – Office of the High Commissioner for Human … for Cultural Rights.